Tim Adams of The Guardian features the work of photographer Trish Murtha in ‘The Big Picture’ section of the newspaper’s website. 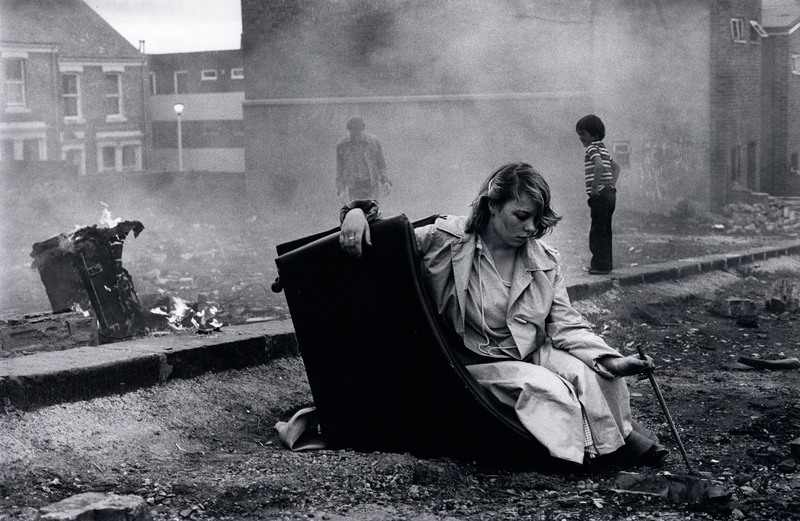 This coincides with an exhibition of her work at The Photographers Gallery; Tish Murtha: Works 1976 – 1991 from 15th June to 14th October 2018. This work from this photographer, that I had never heard of, really impresses me and takes me back to the early 1980s when things looked very different. It was a time of mass unemployment across most of the country, but more so in the industrial and traditional manufacturing areas of Britain. During some of this time I was doing an engineering apprenticeship and studying ‘day release’ at a Tertiary college at Crosskeys in South Wales. When we started in 1979 the class was full of about 35 young men, but by the time we finished in 1982 there were only 5 of us left, the rest had been made redundant as many of their employers were connected with the mining and steel industry in Wales. Trish had the good fortune to study in South Wales at the Newport School of Documentary Photography under David Hurn, but clearly it was her passion and vision that gives us this body of work. I’ll be heading to The Photographers Gallery next month and have ordered a book produced by her daughter Ella called ‘Youth Unemployment’ to get a head start. ‘In 1976, Tish Murtha, the third of 10 children of Irish descent, left her native north-east to study photography at Newport College of Art in south Wales. She returned two years later to train her camera on the streets on which she had grown up. Murtha, who her daughter, Ella, recalls as “spiky haired, and in baseball boots”, took this photograph in 1980 on the council estate of Elswick in Newcastle, while she was on a job training scheme for the unemployed. ‘Tish Murtha: Works 1976 – 1991 is a new exhibition which charts the remarkable accomplishments of documentary photographer Tish Murtha (b. South Shields 1956 – d. 2013) and offers a tender and frank perspective on a historic moment of social deprivation and instability in Britain. “My impression is of a whole generation thrown on the scrapheap, yet still making the best of what they have,” says Ella Murtha of Youth Unemployment, the series shot by her mother, Tish Murtha, over a few years from 1979 in Newcastle. “I see a great bunch of kids, who may not have much in the way of material possessions, but who are rich in the fact that they have each other. The sense of community and friendship is strong as they suffer the misery of debilitating boredom together, and my mam documented their attempts to alleviate it. Murtha’s images record a time of great change in Newcastle, a city that had been an industrial powerhouse but which was experiencing mass closures of factories and mines, and spiralling unemployment as a result. In the vacuum young adults found few opportunities, and faced severe poverty not experienced by their southern counterparts. Deprivation was an everyday fact of life and in that they were not alone, with youngsters in cities from Manchester to Glasgow, Birmingham to Liverpool feeling the effects of a similarly rapid and debilitating transformation. “The whole work force was affected by the economic recession, but the problem of youth unemployment was very new and the problems associated with it were manifesting in a new way,” explains Ella of the turbulent economic time. These financial difficulties were something to which Tish Murtha was particularly sensitive. The third of 10 children, she was born in South Shields in 1956 and left school at 16, selling hot dogs and working in a petrol station to support herself. After enrolling on a night photography course, Tish decided she wanted to become a photographer, and was offered a place at the prestigious School of Documentary Photography at the University of Wales under the guidance of Magnum photographer David Hurn. Images became the way she could express the dissatisfaction she saw all around throughout the Thatcher era. “She believed that photography was an important form of visual communication that could stimulate discussions about real-life situations and captured accurate records of the world we live in. She was trying to force people to look at the truth and learn from it,” explains Ella. Tish’s images capture a raw picture of the struggles faced by the youth at the time. She would often photograph her family, friends and neighbours – people she spent time with every day, and whose struggles she shared. Capturing candid shots of youngsters on the streets, playing cards, building dens and fire, or causing mischief came naturally, because the subjects trusted her. “She loved to photograph people; she always spent a lot of time talking and listening, and was genuinely interested in them. Growing up we couldn’t go anywhere without her befriending randoms,” laughs Ella fondly. Taking hundreds of photographs over just a few years, the collection is all-encompassing – yet when Tish died of a brain aneurysm in 2013, she had never released a photobook. Now her daughter is creating one in her stead. Using old notes and documents Ella brought the publication to life, creating a Kickstarter page and finding support from across the country. The Kickstarter also rapidly raised enough money to publish – something that Tish herself would probably never have done. And although the photographs were taken almost 40 years ago, Ella believes that they are as socially and culturally relevant as ever, particularly after the 2007/08 financial crisis. Looking back over the images, she finds a powerful story for today’s politicians and youth – and a warning.